Guinness PRO12 Ulster v Newport Gwent Dragons at Kingspan Stadium, Belfast. Ulster's Stuart McCloskey is tackled by the Dragons Adam Hughes. Darren Kidd Press Eye. Guinness PRO12 Ulster v Newport Gwent Dragons at Kingspan Stadium, Belfast. Claire Hutchinson of Diageo with man of the match Ulster Paddy Jackson. Picture by Darren Kidd / Press Eye. Guinness PRO12 Ulster v Newport Gwent Dragons at Kingspan Stadium, Belfast. Ulster's Stuart Olding and Paddy Jackson. Picture by Darren Kidd / Press Eye. Guinness PRO12 Ulster v Newport Gwent Dragons at Kingspan Stadium, Belfast. Paddy Jackson kicks the winning penalty for Ulster. Picture by Darren Kidd / Press Eye. Guinness PRO12 Ulster v Newport Gwent Dragons at Kingspan Stadium, Belfast. Ulster's Alan O'Connor. Picture by Darren Kidd / Press Eye. Guinness PRO12 Ulster v Newport Gwent Dragons at Kingspan Stadium, Belfast. Ulster's Darren Cave is tackled by the Dragons Ben White and Angus O'Brien. Picture by Darren Kidd / Press Eye. Guinness PRO12 Ulster v Newport Gwent Dragons at Kingspan Stadium, Belfast. Try for Ulster's Sean Reidy, tackled by the Dragons Picture by Darren Kidd / Press Eye. Guinness PRO12 Ulster v Newport Gwent Dragons at Kingspan Stadium, Belfast. Ulster's Roger Wilson is tackled by the Dragons Charlie Davies. Picture by Darren Kidd / Press Eye. Guinness PRO12 Ulster v Newport Gwent Dragons at Kingspan Stadium, Belfast. Try for Ulster's Sean Reidy. Picture by Darren Kidd / Press Eye. Guinness PRO12 Ulster v Newport Gwent Dragons at Kingspan Stadium, Belfast. Ulster's Sean Reidy is tackled by the Dragons Rynard Landman and Ed Jackson. Picture by Darren Kidd / Press Eye. Guinness PRO12 Ulster v Newport Gwent Dragons at Kingspan Stadium, Belfast. High tackle on Ulster's Ruan Pienaar is tackled by the Dragons Ben White. Picture by Darren Kidd / Press Eye. Guinness PRO12 Ulster v Newport Gwent Dragons at Kingspan Stadium, Belfast. 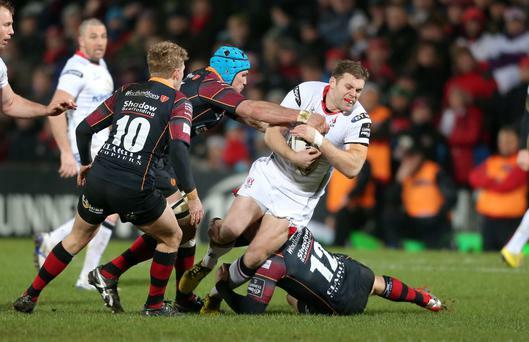 Ulster's Stuart McCloskey is tackled by the Dragons Nic Cudd and Carl Meyer.Picture by Darren Kidd / Press Eye. Guinness PRO12 Ulster v Newport Gwent Dragons at Kingspan Stadium, Belfast. Ulster's Darren Cave is tackled by the Dragons Ben White and Angus O'Brien.Picture by Darren Kidd / Press Eye. Guinness PRO12 Ulster v Newport Gwent Dragons at Kingspan Stadium, Belfast. Try for Ulster's Sean Reidy, tackled by the Dragons. Picture by Darren Kidd / Press Eye. Guinness PRO12 Ulster v Newport Gwent Dragons at Kingspan Stadium, Belfast. Ulster's Sean Reidy is tackled by the Dragons Rynard Landman and Ed Jackson.